Jupiter – Place of Hope will welcome golfers to a new venue for an annual event that draws from across the country to help abused and neglected children throughout Florida. 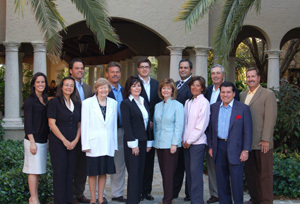 At Place of Hope’s 2009 Golf Invitational & Charity Dinner, to be held May 3-4, guests will play The Bear’s Club in Jupiter. The Bear’s Club is the realization of Jack Nicklaus’ decades-old vision of creating a golf club in his own South Florida backyard that reflects his passion for the game. The course is covered with old pines and palmettos. There is a 12-foot-high sand ridge running across the site. Nicklaus enhanced it and added a couple of others that look equally natural. According the Bear’s Club website, Nicklaus integrated the design into the environment by retaining native brush wherever possible, separated from playing areas by transition areas of sand and pine straw. It has high-banked bunkers with special sand brought in from Ohio that won’t wash out in a rain shower. The 18-hole “Bear’s” course features 7,164 yards of golf from the longest tees for a par of 72. The course rating is 75.2, and it has a slope rating of 146 on Bermuda grass. Designed by Nicklaus, ASGCA, the Bear’s golf course opened in 2008. It was named Golf Digest Magazine's Top Rated Golf Courses for Florida in 2005 and Golfweek Magazine’s America’s Best Top 100 Modern (post 1960) courses also in 2005. Tequesta resident Maudie Pande, a longtime supporter of Place of Hope, will be honored at this year’s dinner for her dedication to foster children and that of her late husband, Larry Pande. Place of Hope is located at 9078 Isaiah Lane in Palm Beach Gardens. For more information, please call 561-775-7195 or visit online at www.placeofhope.com.